Your concrete driveway or garage may not be your favorite aesthetic feature or the envy of all your neighbors. It’s just a functional part of your property. But when a nice concrete surface starts to collect oil and antifreeze stains, it suddenly becomes a noticeable feature—and not in a good way. Thankfully, there are effective methods for removing stains from concrete. 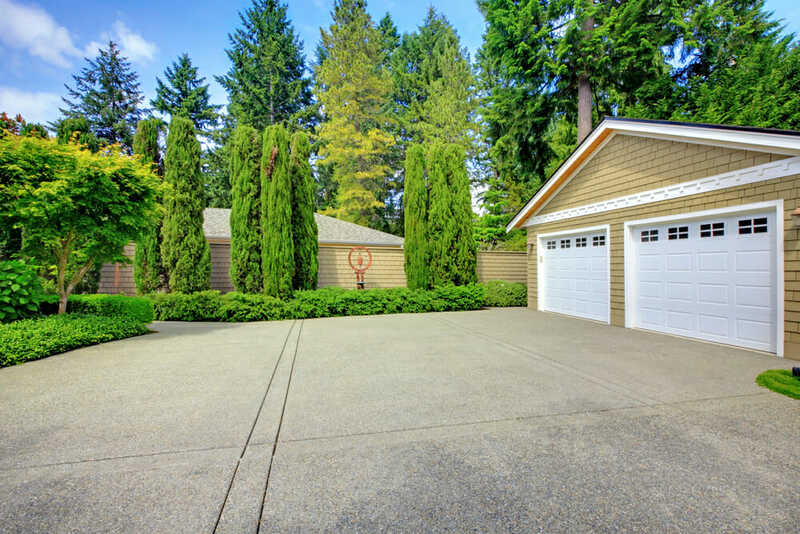 For especially stubborn spots, muriatic acid may be the solution to your soiled driveway needs. Muriatic acid, also known as hydrochloric acid, is a powerful substance with many applications in manufacturing and household products. It can be used as a cleaner to get out tough stains—but it should be handled with caution, since it’s highly corrosive and poses the risk of burning to anyone who comes in contact with it. While it corrodes almost anything it touches, this is not true of concrete. The acid works well on concrete and on many masonry projects because it neutralizes alkalinity. The surface becomes “etched” and clean, which allows for the proper adhesion of a new coating. Despite its effectiveness, muriatic acid should be used on concrete stains only if you’ve tried gentler alternatives to no avail. Safer alternatives include trisodium phosphate—which still poses risks but is not as strong as muriatic acid—and sandblasting, which is a manual rather than chemical process. If you’ve decided that muriatic acid is the only effective treatment, we recommend that you contact a professional and allow them to handle the project. However, if you decide to do it yourself, you can find muriatic acid in your local hardware store sold as 31.45 percent acid to 68.55 percent inactive ingredients (mostly water). Make sure to read all instructions and follow these guidelines to protect yourself and others from harm. Use protective gear. The National Institute for Occupational Safety and Health (NIOSH) lists recommended safety gear for those who will come in contact with hydrochloric acid. You should use the appropriate respirator as well as protective clothing, rubber boots, rubber gloves, and goggles. Keep a neutralizing agent on hand in case of an accident. Baking soda, garden lime, or water will all work. You should have plenty of clean water on hand anyway, since you’ll need to dilute the acid (yes, even the acid that’s already diluted and sold in stores). Clear the area. Make sure there are no children or pets nearby and that you’ve cleared out any belongings you don’t want ruined. Let nearby adults know about the dangers associated with the project. Finally, confirm that the area is well ventilated. Use only a plastic bucket (never metal) to dilute the acid. Even the diluted amount of acid is too strong for home use, so you will need to dilute it further according to the product’s instructions. Pour acid slowly into water (never pour water into acid!) and be patient as you do so—rushing could put you at unnecessary risk. Measure carefully and stir it only with plastic or wood—never metal. Don’t mix with any other chemicals or products. Use a brush or sprayer to apply the acid directly over the stained area. Surround the area in question with a neutralizing agent. Leave the acid on for twenty minutes, then scrub. Repeat if needed. Apply garden lime or baking soda over the soaked area when you’re finished, then rinse it off. Use ample amounts of water. Neutralize any leftover solution. Read the directions on the product thoroughly and only use this method if you feel confident. If you’re not sure about using muriatic acid, contact an experienced concrete specialist in your area, one who is equipped to deal with the hazards and do an excellent job.